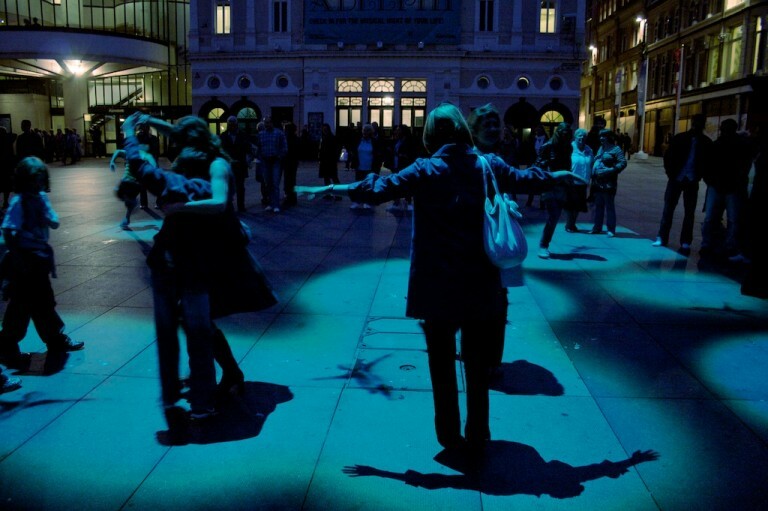 Inspired by Tchaikovsky’s Swan Lake, Flock is a large-scale interactive public installation originally commissioned by the ICA with the support of the Royal Opera House that premiered in Trafalgar Square in February 2007. Later in 2007 Flock toured throughout the South West of England, and was performed in 2008 in Liverpool as part of the ’08 Liverpool European City of Culture Celebrations. Flock (a free event) created a “virtual Swan Lake” in the heart of the city where members of the public became "pedestrian performers” and embarked on a journey where fantasy and reality merged. Each classical ballet features a ‘white act’ in which the hero usually comes into a realm where fantasy and reality merge. In Swan Lake a Prince encounters an enchanted band of Princesses – swans by day, women by night. Combining the romance and emotion of fairy tale with the classical groupings and lines of precisely drilled dances, this corps de ballet showcase seems the archetypal image of ballet to many people. As a dancer, the experience of working as part of such a large group to such bombastic music (usually Tchaikovsky finest) is also incredibly powerful. Flock will re-imagine this experience altogether with audience members becoming the dancers, the corps de ballet, themselves. As the general public step into Flock they immediately realise that the seemingly innocent space is actually enchanted. The pavement is primed so that the moment a person steps into the space it will react. The technology detects a person’s presence and allocates each participant their own personal spotlight. Following the light they cast, each participant reveals a series of ghostly projections. These take participants on a journey through the real physical space and also the emotional narrative of the ghostly swan world. What is a seemingly personal experience for the participant becomes something bigger when viewed from afar and by onlookers who form its audience. Each participant’s journey through the space is intricately connected to the group as a whole – ultimately creating a coordinated corps de ballet of pedestrian performers, as engaging to the bystander as the performer in the installation. 2007 Plymouth, Salisbury, Taunton, Bournemouth, Truro, UK. FLOCK was a landmark piece in the development of live digital art. It has received extensive press and media coverage including; Features in The Times, The Guardian, Time Out, Live coverage of the launch on BBC Radio 4’s PM Programme, BBC TV Breakfast News, BBC TV London News, and interviews on BBC Rado London and Capital Radio.